RV AND TENT CAMPING ON THE RIVER! 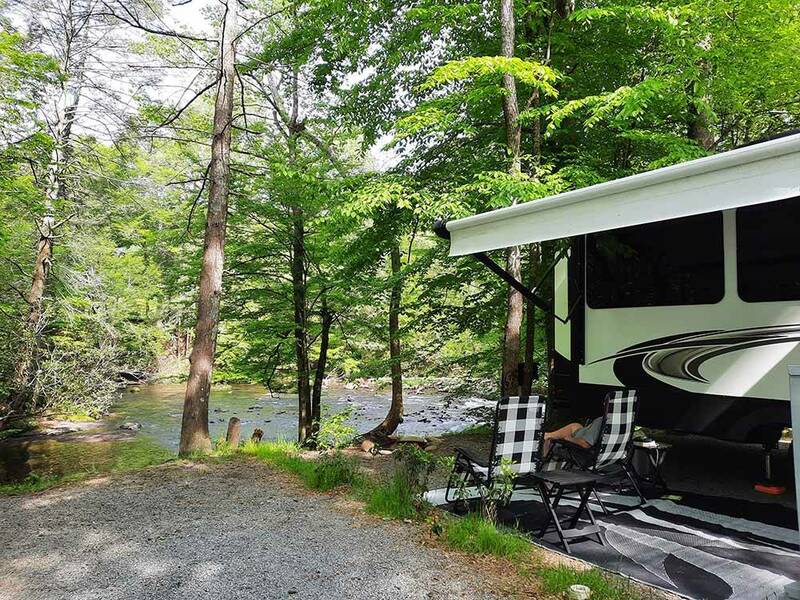 Located on the Little Pigeon River & only 6 miles to downtown Gatlinburg, Greenbrier Campground offers RV, tent camping, cabins & more! Luxury bath houses, laundry facility, game room, playground, camp store & beach on site. We have stayed here numerous times both with our camper and in the campgrounds bell tents the property is kept up and clean staff arw awesome and also friendly. They are also adding different items seems like every chance they get we love it here and book as much as we can during the year. We stayed here in the fall, campground was clean and well kept, close to amenities. Would stay again! If i could rate it higher I would. We found this campground 2 years ago and have not been anywhere else. We try to go every other weekend from spring till fall. If you are looking for a true camping experience , this is it. There is no pool but there is a wonderful swimming hole to swim and raft in. This sits on an island with the river faster on one side which is great for tubing with kids and slower on the other side which is great for putting your chairs in to cool off. The sites are wonderful . Mist are surrounded ny big shade tree. Big play area for kids. The staff is absolutely the best. I know for sure once you go you will want to go back. Website is great to check the size if the site you are looking at. Please don’t take my advice. Try it for yourself, I’ve already booked next year. After searching online for several campgrounds in Gatlinburg, we came across this hidden gem. It's just on the edge of the city and is surrounded by river and creeks. It feels like you're camping in the woods while all the other places are simply big parking lots for RV's. The grounds are beautiful, the streams are great for wading and exploring, and the "swimming hole" is a ton of fun. This is what we will compare future destinations to, and I'm afraid they won't live up. Also, it is priced at about half of what the other RV parks were in the area. If we make our way to the Smoky Mountains again, we'll no doubt be back here. There are several full hookup sites, as well as other options. I can't speak too much to the bathrooms because we used our own. Camp managers were strict but friendly.